Last year John Deere completely revamped its square baler offering and for next season the company’s four-stringers will get a further raft of upgrades. 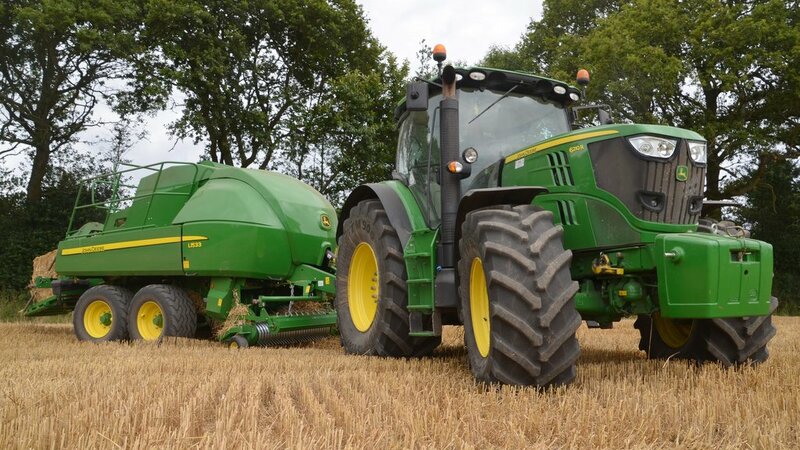 Nick Fone catches up with a 2015 L1533 in heavy crops of Sussex straw to find out how it performs in field. A year after they first appeared on the market, John Deere has announced a round of updates to its sleek-looking 1500-series big square balers. With their curvy plastic panels, the four-string 80cm by 90cm 1533 and six-string 120cm by 90cm 1534 replace two 1400-series models that boasted chambers of the same dimensions. Built in the ex-Vicon baler plant at Gelderop in the Netherlands, now owned by Kuhn, the outgoing models shared everything but their paint job and decals with the French firm’s balers. 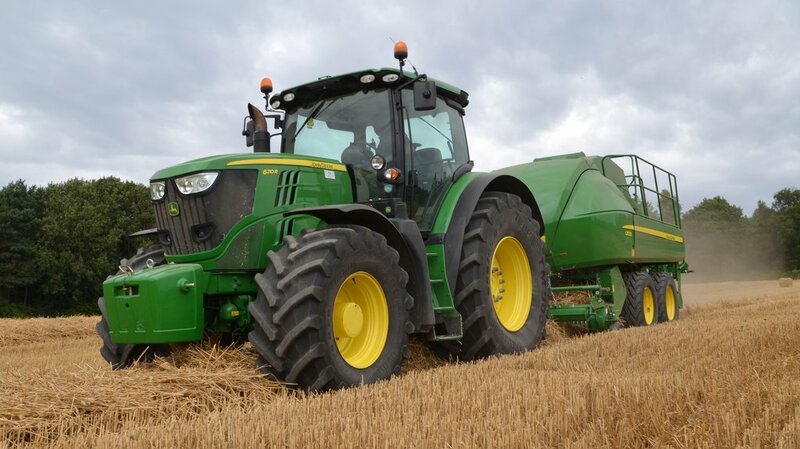 Now however, that has changed according to Deere and the green giant’s influence has made its presence felt in the design of these latest models. Most significant is the switch to double-tie knotters. 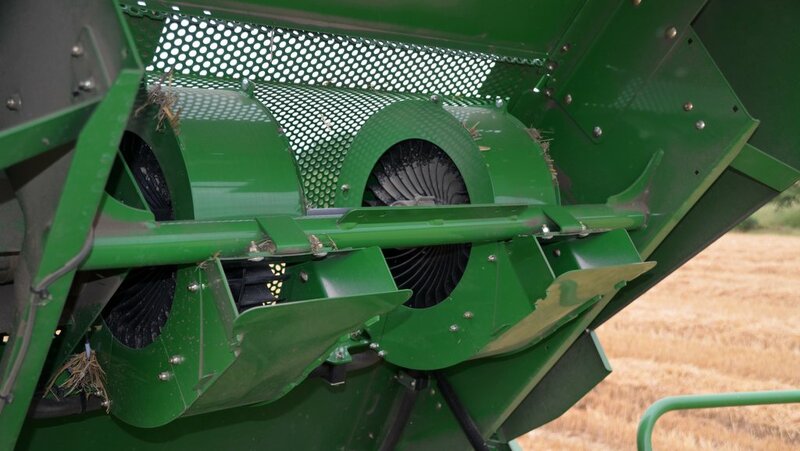 Until 2014, all square balers coming out of the Dutch factory had stuck with a single-tie set-up, but with increasing numbers of customers calling for a double-knot system, Deere decided it needed to become standard spec. In contrast Kuhn still offers single-knot balers with a twine-release system to take tension off the knot as it is tied while double-tie knotters are an option. With the knotters tripping twice as often, there’s twice the chance of something going wrong and double the amount of trimmed string-ends, so keeping them clean is more important than ever before. To deal with that, the three electric fans employed before have been ousted by a pair of hydraulically driven turbines that blast tornado-strength winds over the top of the chamber at about 200kph. In addition, JD’s styling allows for different twine storage - 15 balls are arranged along each side, two deep at shoulder height. Kuhn’s versions have them stacked two high. Other than that, there’s little to choose between the red and green painted machines. So what of the 2016 upgrades? On 1533s a 15-knife chopper unit replaces the 10-blade version used before. Like the 23-knife chopper on the six-string 1534, it is now housed in a slide-out cassette tray to make sharpening and servicing an easier task. While the feeding system on 2015 four-stringers remained the same as the old-school 1400s, 2016 versions will gain a 2.3m wide pick-up (previously 2.1m) with five tine bars rather than four with the result that although the pick-up runs at the same rpm, tine speed is actually higher, making for a cleaner finish, according to Deere. In our test in dry wheat straw, the 2015 version left no trace of the swath behind but we are told in sticky silage grass on close-cut swards, the five-bar pick-up has the edge. While that was not apparent in our run-out with the L1533, it was clear that the wider pick-up would be a bonus, even working behind a 6m (20-foot) cut combine. One thing that really stood out from our runs up and down the Sussex stubbles was the feeder overload protection system. 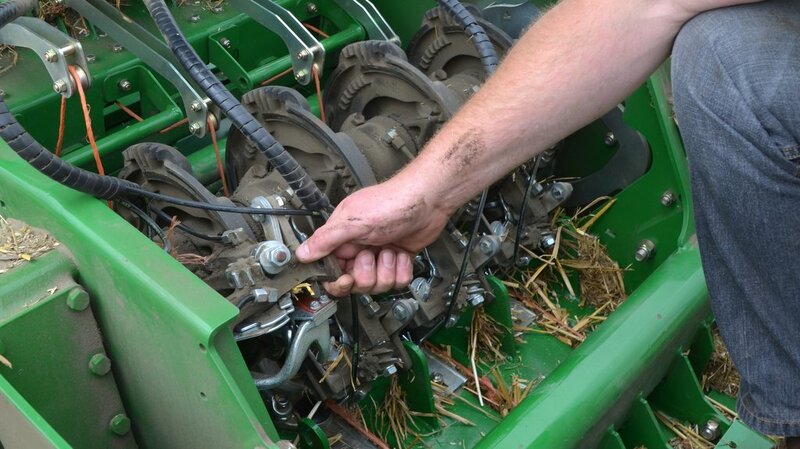 Rather than opting for old-school shear-bolts, Deere has adopted a much cleverer approach. If material builds up at too great a rate in the pre-chamber, a cam-clutch on the feeder fork (stuffer) drive trips out with a loud ‘bang-clack’. All the driver has to do at that point is dip the clutch and back off the revs, allowing the chamber to clear and the clutch to re-engage. Then it is straight back into the swath. We also like the simplicity of the Deere approach to delivering consistent wads of material right up into the top of the bale chamber. In basic terms, the stuffer fingers run on their short filling stroke until wedges at the top of the pre-chamber sense there’s enough material to make a full slice. At that point the wedges trip out, releasing the stuffers for their long plunge stroke. Setting the baler up could not be simpler either. Everything is handled through the IsoBus in-cab controller – in this case John Deere’s CommandCenter touchscreen display. 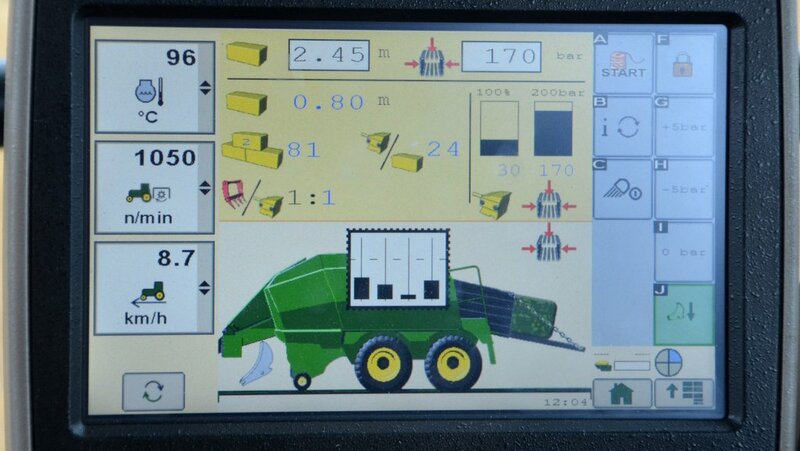 It allows you to monitor slices per bale, the ratio of stuffer to ram strokes and bale length. In addition, there is a bar graph for each knotter showing string tension, effectively replacing the lollipops you find on other brands of baler. Maintenance-wise Deere’s engineers embedded at the Kuhn factory have had to up their game to catch-up with the competition on the access front. They have done it too - with wide-swinging plastic panels and twine lockers that hinge out to reveal the whole length of the chamber, it is difficult to fault. 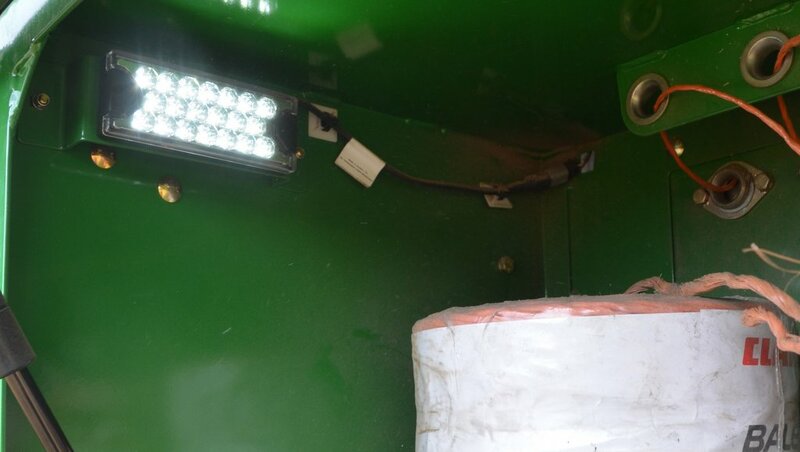 There are even LED lights strategically positioned aft of the pre-chamber over the needles and up front of the twine balls to make late-night niggles a slightly easier issue to deal with. With auto-oilers on the two chain drives – one to the feed rotor, the other to the pick-up – and auto-greasing for everything bar the two-piece pto shaft, daily servicing is no chore. Overall, we are fairly sold on the Deere square baler as a machine. However it is not all about the hardware. Can the green giant’s dealers compete with the skill, experience, parts stock and back up of the likes of Big Bale (North and South)? We are told each of the company’s bigger, better-than-ever dealerships will have its own dedicated baler specialist so watch this space. The revamped L1533 comes on stream next spring. Previous: Barley grain skinning ratings on the horizon?